The 188cm forward arrived at Victoria Park via the Hamilton Imperials with hopes of playing a key role in the club’s renascence under Leigh Matthews as a marking forward. Orval, who stood 188cm, made his debut in a 125-point loss to Hawthorn at Victoria Park. It was a low point in a year of struggle for the Magpies, but Orval was one of 17 debutants as the club laid the foundation for the team that would eventually take out its 14th premiership three years later. Orval held his place for the following week and remained in the senior side for all bar one of the final six games of the season. It was in the final round that he left his mark, kicking four goals from six scoring shots in a thrilling five-point win over Essendon at the MCG. The win was just the seventh of the season for the Black and White, who ended the season in 12th place. Orval’s four goals saw him play a pivotal role in the win, starring alongside Peter Daicos (four goals), Craig Starcevich (four goals) and Matthew Ryan (three goals), while the Copeland Trophy bound Darren Millane kicked two from 35 disposals. Sadly, that four-goal performance would remain the high water mark of Orval’s senior career, with nasty foot injuries restricting him to just one more senior appearance. For the record, it came in the final round of the 1988 when he kicked a goal in a win over Geelong at Victoria Park. It was on that afternoon that foot injuries cruelled Orval’s career. 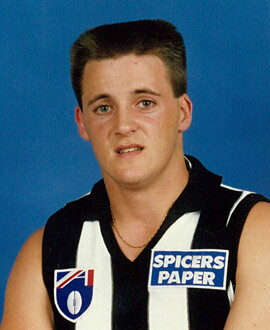 As he explained to The Footy Show Magazine’s John Cooke in 1999, the injury took place early in the opening term. In the years since his retirement, Orval has remained involved at Collingwood as a board member of the club’s Past Players Association. More recently, he has risen to Internet fame as ‘Angry Dad’, as his sons Mitchell and Dylan (who was on Collingwood’s VFL list in 2014 after two years as an Adelaide rookie) perform pranks on their father and record them for the world to see.